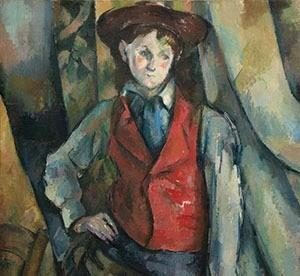 Major Exhibition of Paul Cézanne’s Portraits at the National Gallery of Art, March 25 through July 1, 2018 | Ciao Washington! Bringing together some 60 paintings drawn from collections around the world, Cézanne Portraits is the first exhibition devoted exclusively to this often-neglected genre of his work. The revelatory exhibition explores the pictorial and thematic characteristics of Paul Cézanne’s (1839–1906) portraits, the chronological development of his style and method, and the range and influence of his sitters. The sole American venue, Cézanne Portraits will be on view on the main floor of the West Building from March 25 through July 1, 2018. Cézanne painted almost 200 portraits, including 26 self-portraits and nearly 30 portraits of his wife, Hortense Fiquet, as well as portraits of his son Paul and his uncle Dominique Aubert, art dealer Ambroise Vollard, critic Gustave Geffroy, and the local men and women in his native Aix-en-Provence. The exhibition presents a selection of portraits that reveals the most personal and human aspects of Cézanne’s art.